The Jura WE8 is a professional machine that is simple enough for an amateur to operate. Designed for use in boutique hotels, upscale shops, salons, galleries and small offices, the WE8 professional can handle the demands of repeat brewing. The One-Touch function makes it simple to switch between latte macchiato, cappuccino, flat white and other specialty coffee options at the touch of a button while the high-end design conveys a feeling of luxury. With the power to brew around 30 cups of specialty coffee per day, the Jura WE8 is an ideal professional machine. It features a 101-ounce water tank, a bean container that holds 17.6 ounces of coffee beans and a grounds container with the volume to hold 25 portions. ou don't need to hire a barista or spend hours training staff to use the WE8. The professional machine offers 12 programmable specialties and, thanks to One-Touch technology and TFT display, brewing the perfect latte macchiato, flat white or cappuccino is as simple as pressing a button. The Jura WE8 takes on the role of barista. You can program up to 12 different coffee specialties, eight levels of coffee strength, two brewing temperatures and three hot water temperatures, adjust the height of the spout for coffee, cappuccino or hot water, press a button and let the WE8 do the rest. 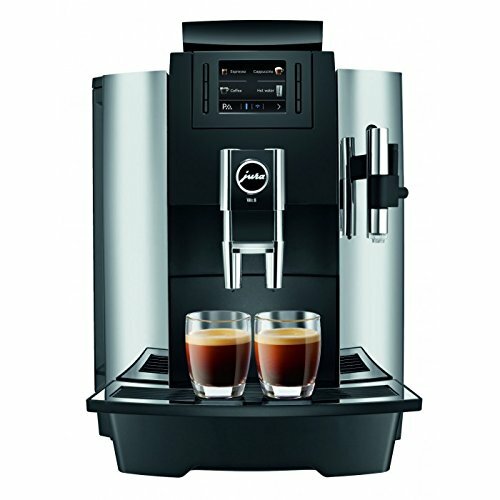 The professional machine features an Intelligent Pre-Brew Aroma System and Jura's unique Pulse Extraction Process (P.E.P.) that optimizes extraction time. The WE8 also offers an Intelligent Water System to detect the filter, CLEARYL Smart and CLEARYL Pro Smart filter cartridges to ensure perfect water quality and a high-performance 15 bar pump to ensure each cup of specialty coffee is brewed to perfection. A Thin Film Transistor (TFT) display that uses color, text and graphics to make brewing simple and intuitive. Fine foam technology produces feather-light milk foam to add the perfect finishing touch to a cup of specialty coffee.